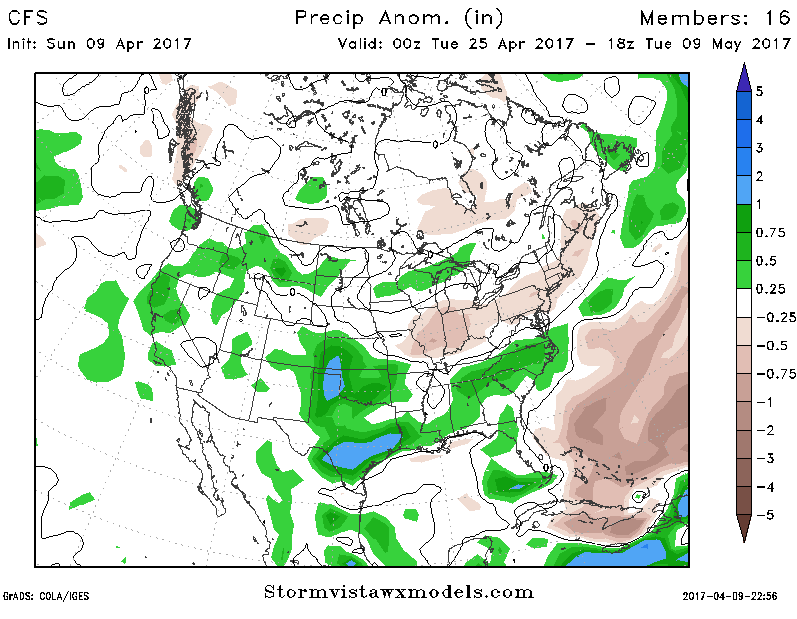 Perhaps not in Nebraska, but elsewhere it looks to be a wet spring. 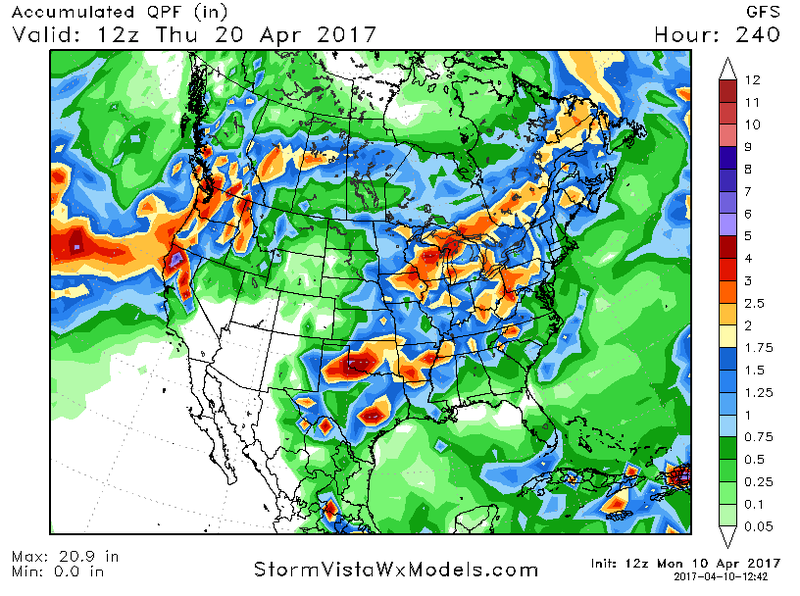 This is a likely scenario amid building El Ninos – even more so than during already established El Ninos – and indeed the two-week forecast includes a steady stream of frontal events, and heavy cumulative precip across the Corn Belt through April 25th. The 16-30 day outlook, above, also includes ongoing normal/above normal precipitation into the opening of May, and so one can see that at least early planted corn across the heart of the Midwest will be minimal. Drought will be eroding further, but a drier pattern is desired. However, our work suggests that planting dates are by no means a significant determiner of yield. 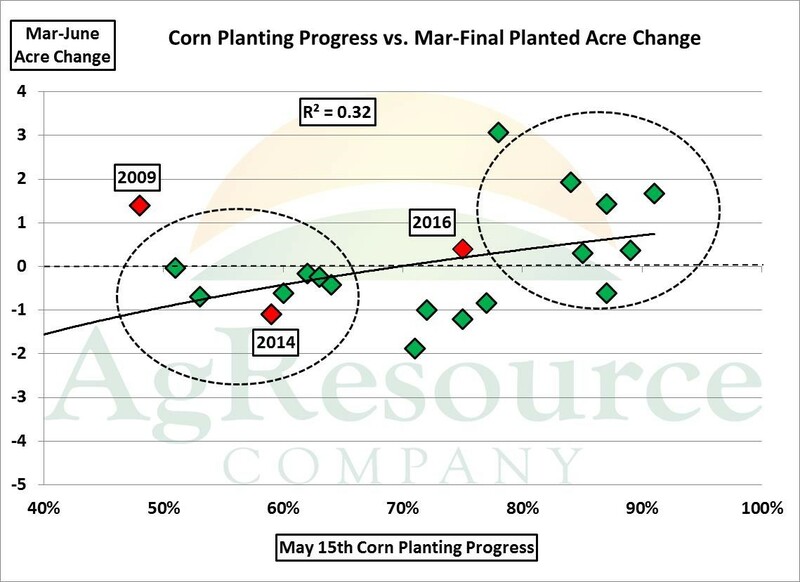 It’s true that, assuming all else equal, an earlier planted crop will perform better than a later planted one, but there are, of course, many variable in determining corn yield beyond the date of planting and emergence. 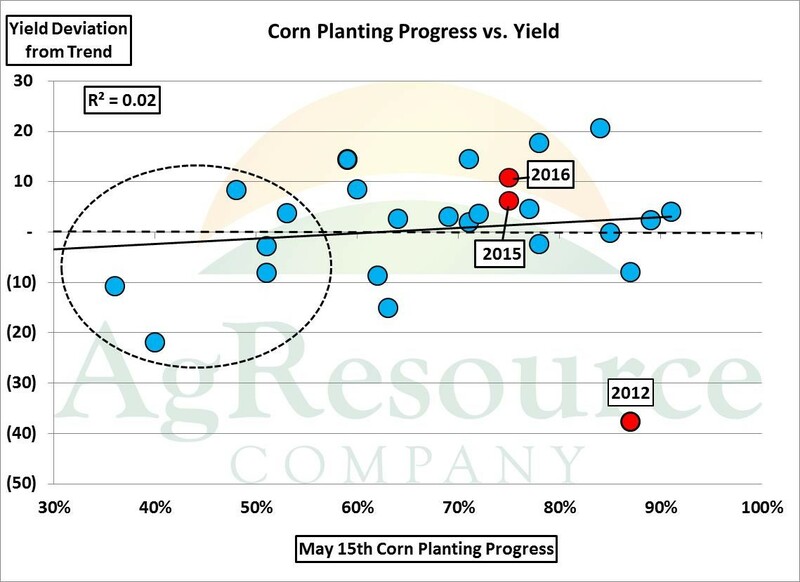 The graphic above displays the correlation between planting progress on May 15th and whether yield that year was above or below trend. The model suggests that if less than 50% of the crop is seeded by May 15th, there’s a tendency for yield to be below trend, but the relationship is week. What about acres? There’s again a general tendency for acres to rise above what are reported in late March if the crop is 80% seeded by May 15th, and for acreage to be abandoned if progress on May 15th is below 65%, but otherwise the relationship is weak. This is why AgResource aims to use any early season weather issues to extend cash sales, as July precip (in the US, Europe, the Black Sea, China) is far more important in fine-tuning balance corn balance sheets.